John Campbell Hamilton-Gordon, Earl of Aberdeen, served as Lord Lieutenant of Ireland briefly in 1886 before returning to the post for a nine-year spell after five years as Governor General of Canada. The Countess of Aberdeen, Isobel Hamilton-Gordon, also left her mark, serving as president of the International Council of Women as well as founding the Victorian Order of Nurses. 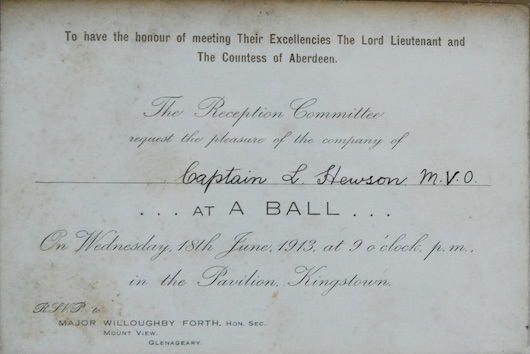 This invitation was sent to Captain Lionel Lloyd Hewson, a Member of the Royal Victorian Order.